Meeting for the second time this season, with a lot more on the line, the Seahawks are looking to duplicate their 26-24 win over the Falcons during NFL Week 6 action. Seattle appeared comfortably in control as they were up 17-3 at halftime. Atlanta QB Matt Ryan went to work out of the break as he threw three TD passes to put the Falcons up 24-17 heading into the final frame. An early fourth quarter 1-yard TD run by RB Christine Michael, plus a 44-yard field goal with 1:57 left in the game, earned Seattle a hard fough victory. That contest was played outdoors at CenturyLink Field – the rematch is being played in the Falcons nest at the Georgia Dome. As illustrated in our LIVE widget below, the venue change has certainly influenced the Seattle Seahawks at Atlanta Falcons odds. Winning the NFC West, plus a 26-6 Wild Card victory over Detroit, propelled Seattle (10-5-1) to this Divisional Round showdown with the Falcons. Looking like the squad that was dominant during Super Bowl XLVIII, the Seahawks seemed to hit a switch on defense and they piled up 177 rush yards during their taming of the Lions. That said, while the Cats were pretty potent on offense at Ford Field this season - they often turned into Kittens on the road during NFL 2016. With Matt Ryan & Crew in their comfort zone under the Dome – this contest is a different challenge for the Hawks. A front runner for the 2016 NFL MVP Award, which is a popular futures betting option right now, QB Matt Ryan helped the Falcons soar to an 11-5 record and the NFC South regular season title. After closing out their slate with a 38-32 win over New Orleans, a contest that almost got away after the Saints outscored Atlanta 19-0 in the fourth quarter, the Falcons enjoyed a bye as the #2 seed in the NFC. Atlanta not having to travel to Seattle is a unarguably a good thing but the Falcons went 5-3 at home this season so that is a concern for anyone considering a bet on the Black Birds. We were dialled in on the Lions vs Seahawks Wild Card game last weekend and we have a solid handle on this contest as well. Although Detroit helped make Seattle’s defense look superior in that match – Richard Sherman & Crew are a playoff savvy bunch that have the ability to “contain” the Falcons high-octane offense. That is particularly true in the ground game as the Hawks allowed a league low 3.4 YPC and they got better as the season wore on. Seattle’s rushing attack coming to life presents a problem for the Falcons defense that gave up an average of 4.5 yards per attempt. Matt Ryan and WR Julio Jones hooked up for 139 yards and a TD in the Week 6 meeting so that combo will be the main defensive focus for the Hawks. Seattle’s running game controlling the time of possession will help keep this contest close and a Seahawks outright win would not surprise us. 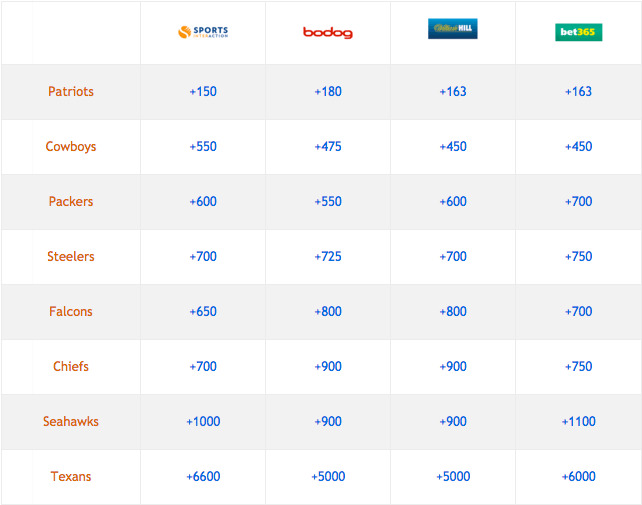 After laying the line in all four games last weekend, we are taking what we feel is a generous +5 (-110) Bodog point spread price and soaring with the Seahawks here. We are focused on the NFL playoffs, up to and including Super Bowl LI, and current contests are listed above for quick access. One of our key NFL 2017 playoff betting tips is to look at defense first and offense second. In that vein, Seattle has an edge as the Seahawks allowed 18.25 PPG while the Falcons gave up 25.37 PPG. Atlanta sored an average of 33.75 PPG while the Hawks put up 22.12 PPG. Expect defense to be a factor in this contest. As mentioned, this match kicks off a series of four Divisional Playoff contests. The Houston Texans vs New England Patriots battle follows the SEA vs ATL fight at 8:15 PM ET on Saturday. The other two Championship Sunday squads will be decided on January 15, 2017, as the Kansas City Chiefs vs Pittsburgh Steelers AFC clash goes at 6:25 PM ET. The Green Bay Packers vs Dallas Cowboys dynamic NFC duel, at 4:40 PM ET, will precede that Divisional match. As illustrated above, the top rated bookmakers here are Canada Sports Betting have posted various prices on Atlanta and Seattle claiming the NFL Championship on February 5, 2017, in Houston, TX. The Falcons odds run between +650 at Bodog to +800 at SportsInteraction but Atlanta isn’t one of our favorites to hoist the Vince Lombardi Trophy. The Seahawks are, somewhat surprisingly, seventh chalk with prices from +900 at Bodog to +1100 at the Bet365 online sportsbook. We bet on Dallas a little early with our Super Bowl LI futures wager as the Cowboys price has ballooned from +400 back in Week 15 to +475 prior to the Divisional Playoffs. As the contenders shrink – so do futures odds so we suggest grabbing your favorite prior to NFL week 18 action this weekend. As always, the odds and scores for every game are updated in real time on our LIVE scoring widget below.